Leaked price goes up as cost of original iPad slides. 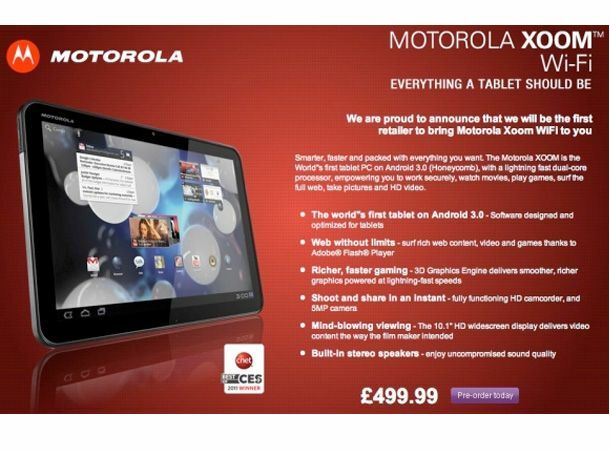 All set to bust out your credit card and pay £449 for a Wi-Fi only Motorola Xoom? Well, we've got some bad news. PC World has just stuck the Android Honeycomb slate back on its online store, having been forced to take down the initial pricing. The new cost? A mind-boggling £499. While punters were unable to pre-order the device at the lower price point, it still represents a bum move by both Motorola and PC World. That hefty tag is made to look even worse with the original iPad now available for just £329 ahead of the iPad 2's arrival on 11 March. Chuck in a lack of Adobe Flash at the start and it seems Moto is doing all it can to hamstring its slate before it hits shelves. Here's hoping the 3G version turns up on some seriously good contracts, otherwise this could well be an Android slate that prices itself out of the market. For more on this and the rest of the day's hottest gadget news, stay tuned to our Facebook and Twitter pages.